Want to enjoy all the fabulous benefits of beets but aren't sure how to prepare them? Although cooking beets may seem daunting, there are numerous ways (many involving 30 minutes or less) to prepare beets. The beet tends to have a bad rap. Passed over for more sightly vegetables and fruits, the quirky and humble beet is often neglected and rejected for its oddly-shaped form and earthy musk. Well- it's time for the sweet and humble beet to shine! Despite its strange-looking and messy appearance, the quirky beet is also remarkably nutritious. Beets improve immunity, help balance hormones, lower and balance blood pressure, increase circulation, detox the liver and colon, soothe and relax nerves, encourage serotonin production, and offer numerous superhero vitamins, minerals, fiber, and antioxidants! Here are 5 Simple(ish) Tips for Preparing (Cooking) Beets - plus delicious BEETastic recipes to make your beet culinary adventure a little more amazing. What are your favorite ways to prepare beets? Roasting beets is a simple way to prepare the beautiful beetroot. Plus - the roasting process enhances the beet's uniquely earthy and sweet flavor. Serve roasted beets in salads or as a side-dish with a dash of lemon juice, olive oil, and sea salt. Gently rinse beets and trim off stems and leafy tops (save for a delicious sauteed beet greens appetizer or pickled-stems side-dish). Roast beets until tender and easily pierced with the tip of a knife, about 30-35 mins (Roasting time may vary based on size of beetroot). Beets are cooked when easily pierced with a fork or knife and tender. Remove beets from the oven and take off foil. Immediately Immerse beets in an ice bath for easy skin removal. Slice off leaf end after beets are cool enough to handle. When beets are cooked well, the skin is easily removed. Push skin off using thumbs. If skin doesn't easily strip away, the beets may need more time in the oven. Try another 8-10 minutes. Then rub off the skins with your thumbs or a paper towel (an easy no-mess option). Steam beets (with skins) for a simple and fast way to prepare beets. Steaming beets retains nutrients and is an easy method if you have a steamer on hand. Steamed beets are delicious in salads or smoothies (especially if you do not own a high-speed blender). Fill the bottom of a steamer with 2-3 inches of water. While the water is heating, wash beets, leaving 2 inches of tap root and 1 inch of the stem on the beets. Cut beets into halves or quarters (depending on beetroot size). Do not peel. Peels retain beet nutrients while cooking. Steam beets covered for about 15-20 minutes. Beets are cooked when you can easily insert a fork or the tip of a paring knife into the beet. After beets are cool enough to handle, slice of leaf ends. When beets are cooked well, the skin is easily removed. Push skin off using thumbs. If skin doesn't easily strip away, the beets probably need more time in the oven. Try another 8-10 minutes. Then rub off the skins with your thumbs or a paper towel (an easy no-mess option). Boiling beets is a simple way to prepare beets, and the skins are really easy to remove! Beets are best cooked with the skins attached as the skins will help the beet preserve its nutrients and prevent leaking of the beet color. 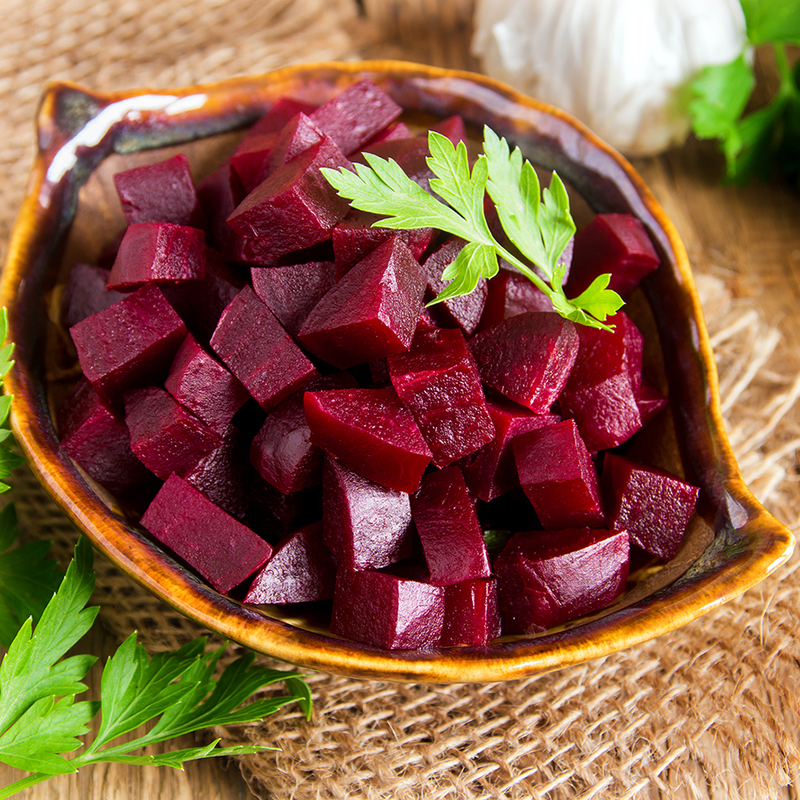 The red natural hues is what makes the beet so attractive in foods. Adding lemon juice or vinegar to the pot when cooking will also preserve the color. Gently rinse beets and trim off stems and leafy tops (save for a delicious sauteed beet greens appetizer or pickled-stems side-dish). Don't peel! Place beets in a large saucepan. Add water to cover the top of beets (optional: to keep beets from bleeding add 2 tbsp freshly squeezed lemon juice or vinegar). Watch the boiling process, however, as with too high of a temperature, pink beet water may splash around your stove top and on your skin if you are too close. Reduce heat and simmer until tender, about 45 minutes (beets are cooked when tender and easily pierced with a fork). Remove saucepan from the stove. Drain water but don't throw it away! Save the water from cooking beets to add to a beet soup or dandruff eliminator. Baked beets provide a delicious snack, such as homemade Beet Chips. Besides baking as chips, because beets are naturally sweet and moist, they are perfect for adding to baked goods, such as Beet Espresso Brownies or Beet and Apple Muffins. Preheat oven to 375° F and place oven rack in the center of the oven. Thinly slice beets (keep skins attached) with a mandolin or a sharp knife, getting them as consistently thin as possible. 1/16" is an ideal thickness. They should curl a little when cut. This will ensure even baking and crispiness. Divide between two baking sheets and spray or very lightly drizzle with olive oil. Gently toss to coat or apply oil to veggies with a pastry brush. Sprinkle with your favorite seasonings. Arrange sliced beets in a single layer, making sure the slices aren’t touching. Bake for 20-25 minutes or until crispy and slightly brown. Rotate pans once halfway through the baking and flip beet chips (if motivated). Be sure to watch closely past the 15 minute mark as chips can burn quickly. Remove from oven and let cool. Then serve. Beet chips are best served fresh from the oven. There is no cooking involved with this delicious way to prepare beets. Raw beets are super sweet and crunchy! Plus -raw beets contain the most nutrients and fiber, so eating beets raw offers many health benefits. Grate beets (wear gloves to avoid pink fingers) for a quick go-to salad or addition to baked treats, such as Beet Blueberry Almond Cobbler. Remove beetroot skin (The skins are edible, so if you don't mind the taste or texture, keep skins attached). GRATING: Using a small-medium sized grater, grate raw beets (wear gloves to avoid pink fingers and grate beets over a non-porous surface, such as a stainless steel cutting board or plate). Follow these 5 tips for preparing beets. BLENDING: Cube, dice, or quarter raw beets for smoothies or juicing. SPIRALIZING: Using a spiralizer, create raw beet pasta noodles, salads, and more. Just Beet It Tip: Preparing raw beets can be a big mess, so wear gloves to avoid stained fingers; grate, cube, quarter, or spiralize a large batch at once and freeze raw beets in freezer-friendly containers or Zip-loc bags. Frozen raw beets are perfect for easy smoothie making on the go!